GAINESVILLE, Fla. -- President-elect Donald Trump has not minced words about his approach to environment and energy policy: He loathes regulation and wants to increase the use of coal, offshore drilling and fracking. Trump has said he believes climate change is a hoax and that he would “cancel” U.S. involvement in the landmark Paris Agreement on global warming. While he’s been vague about precise policies, Trump’s election likely means trouble for some of President Barack Obama’s signature environmental initiatives, environmentalists and policy analysts say. In a signal of how he plans to approach the issue as president, Trump has selected a skeptic of climate change to lead his Environmental Protection Agency transition team. Myron Ebell of the Competitive Enterprise Institute’s (CEI) is also viewed by many as a top candidate to become the next head of the EPA. Ebell’s research focuses on questioning what he calls “global warming alarmism” and opposing energy rationing policies, according to his biography on CEI’s website. Where does Donald Trump stand on energy and the environment? Analysts say it’s probable that Trump’s administration will seek to weaken or kill the Clean Power Plan, a cornerstone Obama policy meant to reduce carbon pollution from the nation’s power plants as part of an effort to combat climate change. The Clean Power Plan is being challenged in federal court, and if it survives, Trump could move to scuttle it. But not without a fight. Any move to back out of the Clean Power Plan or the Paris Agreement could be extremely unpopular moves, environmentalists argue. Polls have shown a majority of voters in at least two states surveyed believe global warming is a serious problem. An exit poll conducted for The Associated Press and television networks found that about half of Trump voters in Florida, a state he carried, agreed that climate change was a serious problem. In Maine, just over half of Trump supporters also agreed, while about four in 10 disagreed. 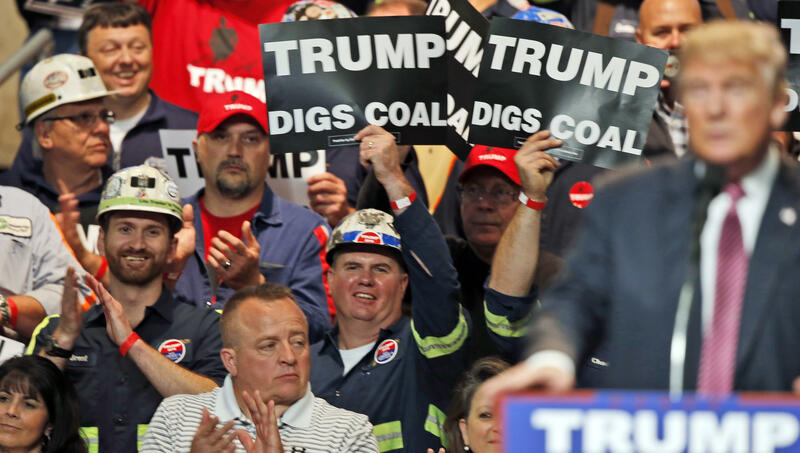 Trump also has vowed to tap into America’s coal reserves in an effort to put the shrinking energy sector back to work. In a speech in the Bakken shale fields of North Dakota, he also said he would increase hydraulic fracturing, or fracking, in the nation’s shale and natural gas reserves to further remove any dependence on foreign energy sources. Industry advocates are buoyed by the possibilities presented by Trump’s win. “We look forward to working with the new administration” on issues such as opening more public land and offshore areas to oil and gas drilling, building more energy infrastructure and reducing environmental regulations, American Petroleum Institute President Jack Gerard said Thursday. He would not say whether he supported a U.S. withdrawal from the Paris climate agreement. Likewise, the coal industry believes Trump “understands the urgent need to rein in the Washington bureaucracy and sweeping, excessive regulations” to protect coal jobs in an industry where sharply falling demand for coal has led to permanent plant closures, the American Coal Council said. “The coal sector has been devastated by lower demand and job loss in recent years due to the mounting impact of regulations pointed squarely at our industry,” American Coal Council CEO Betsy Monseu said. Some question whether it would make economic sense for the U.S. to attempt to increase the use of coal, a fuel being phased out of the energy picture due to its pollution and falling prices of renewables such as solar and wind. Environmentalists said Wednesday they hope Trump concludes opening the Atlantic and Arctic to offshore drilling is a bad business decision. Concerns over the incoming administration’s environmental approach were not confined to policy. Some climate scientists expressed concern that the Trump administration could reduce government’s efforts to study climate change. For example, some Republicans have long wanted to stop NASA’s role in studying earth science and climate change — a key contribution to scientific understanding of the issue that helps drive policy decisions. Waleed Abdalati, a former NASA chief scientist, said in an email that the agency’s contributions are extremely important to the nation’s success.